By Father William J. Byron, S.J. Countless people tried to touch Pope Francis during his recent visit to the United States. Many succeeded. But one inmate at the Curran-Fromhold Correctional Facility in Philadelphia made contact in a firm handshake that was caught in a photograph that made Page 1 of The New York Times on the Monday morning when the pope returned to Rome. 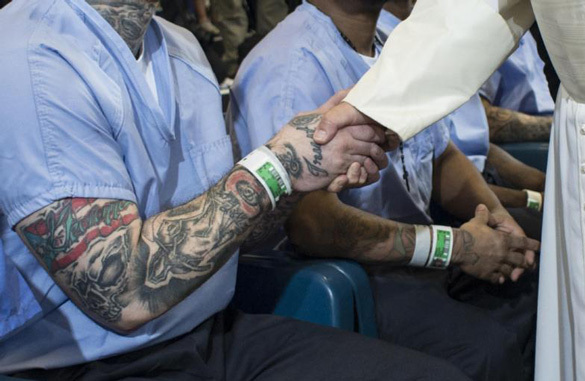 If a picture is worth more than a thousand words, the photo of the pope’s right sleeve and hand in the grip of the right hand attached to the heavily tattooed forearm of an unidentified inmate speaks volumes. Reaching out to the poor, breaking away to the periphery, getting close enough to catch the “smell of the sheep” – all parts of the pope’s message to American priests, bishops and faithful during his brief visit here – were caught in that one photograph. He spent quality time with about 70 incarcerated men and women on a Sunday morning. They couldn’t come to him; he went out to them. It remains to be seen, of course, whether those now either inside or outside correctional facilities across the land will eventually come together in a form of solidarity that embodies freedom and productive partnerships worthy of our human dignity. It won’t happen unless many other hands in other sleeves and other forearms, with or without the adornment of a tattoo, find each other and form productive partnerships. That handshake also suggests to me that Pope Francis believed he was touching Jesus when he touched the unnamed inmate. “Lord, when did we see you ill or in prison and visit you? (Mt 25:37). “‘Amen, I say to you, whatever you did for one of these least brothers of mine, you did for me’” (Mt 25:40). A handshake seen all over the world may prompt some to do what they can to prove that “confinement is not the same thing as exclusion” and get to work reforming the correctional system and helping former prisoners find their way back to productive lives. I hope our pastors and our politicians will use their positions of influence to encourage progress along these lines. Jesuit Father William J. Byron is a university professor of business and society at St. Joseph’s University, Philadelphia.